← Building New Offices – The Opposite to our usual Demolition! 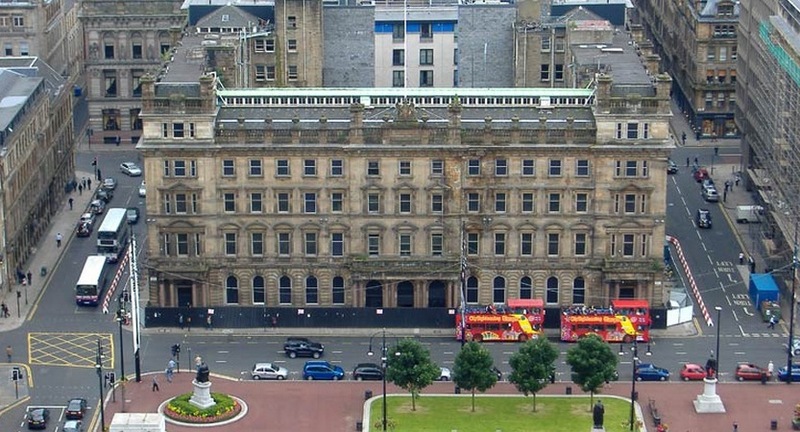 1, George Square, Glasgow was the home of the once famous General Post Office Headquarters, constructed in 1875, which was classed as the absolute central point of reference for the City`s postcode and mileage charts. The G1 building had been vacant for about ten years and was in need of specialist demolition. In 2000 the southern section had been converted into high class residential occupancy with an addition storey added for penthouse apartments. The northern section had been acquired by a developer with the intention of extending the residential and penthouse development from the southern section. Due to the building being vacant for such long a period of time it had deteriorated extensively. Planning Requirements stipulated that the facade was to remain, the complete internal structure that had rotted and perished, was to be carefully deconstructed. To meet this objective a façade retention system was to be designed, this in turn was to be supported on bored piles, an opening in the facade was to be created, to allow access and egress to and from the site, all stone work being carefully removed, numbered and stored in readiness to be placed back on completion of new construction `as it was prior to the works starting`. This was one of our most technical demolition contracts to date which required a number of specialist demolition techniques. There were many difficulties in boring piles due to the myriad of services that were incorrectly charted and positioned on services layout drawings. This in turn caused design problems for the footprint layout of the retention system. As is usual problems are there to be solved then overcome and we overcame the ones on the G1. Noise pollution then became a problem. The residential occupancy of the southern section was home to lawyers, footballers and business people whose homes were separated from our site by a mere 100mm (4inch) block wall, separation cuts in the concrete floors proved to be another particular problem, no noise or disturbance before 09:00 or after 16:00. 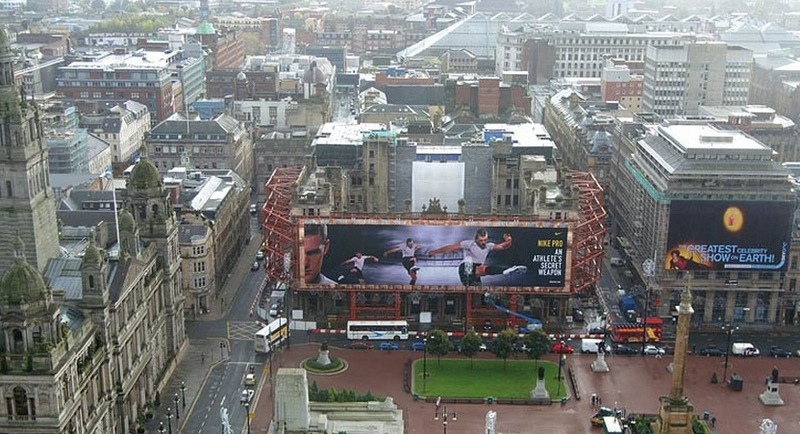 Even Nike got a kick out of our complex demolition in Glasgow! The sandstone internal walls had perished to the point of collapse; this created a continual stability problem to the structure especially when working in close proximity to the site boundaries. We were pleased to hand the site back to our employers on completion of what turned out to be one of the most challenging specialist demolition contracts completed by Coleman to that date. 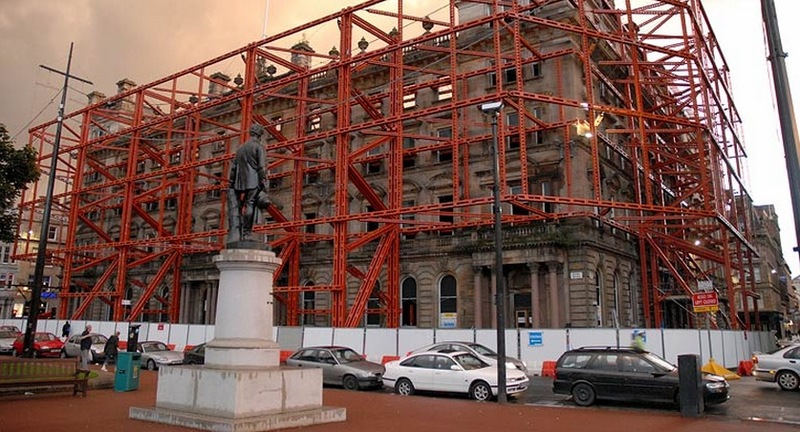 Why not learn more about the façade retention and complex demolition techniques we used to demolish the inside of the G1 building in Glasgow here? This entry was posted in Civil Engineering, Complex Demolition, Demolition, Design Preconstruction Services, Facade Retention, Health & Safety, Temporary Works. Bookmark the permalink.